Cleanliness is one of your club's best sales and marketing tools. And showers are the number-one place members look to assess cleanliness. In fact, nearly 60% of your members, and potential members, are judging the cleanliness of your facility on nothing but your showers. Knowing that you risk losing 10% of your members due to your club's cleanliness...how clean are your showers? Being the first and last place members visit when they come to your gym, your locker room says a lot about your facility. And since locker rooms are heavily frequented, they’re also some of the hardest spaces in your facility to keep well stocked and clean. 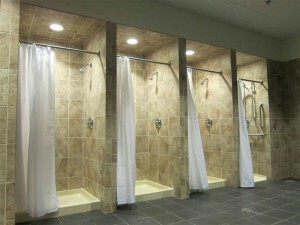 Check out our Locker Room Essentials Guide and learn more about what it takes to really keep your showers and your locker rooms as clean as possible and thus retain more of your members. We know it's not a simple task to keep your club clean at all times. It requires a "philosophy of clean" to pervade your business. But we also know that if cleaning is a part of your club's value system, tied in to your mission and your vision, then you know your club is going to be clean. At the end of the day, a clean facility is an opportunity to maintain a healthy bottom line.